FunBites Squares instantly cuts kids’ food into 12 bite sized squares. Made in the USA of high-performance food grade material chosen for its strength, sharpness, and durability FunBites are a great gift idea for the youngster on on your gift list. This cutter will make both parent and little one happy. Learn more about this 2016 Ultimate Holiday Gift Guide Item HERE. 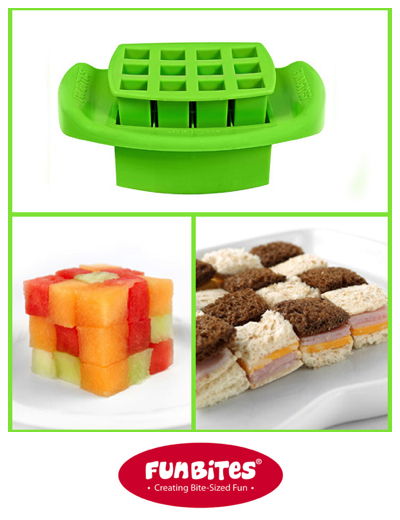 FunBites award winning food cutters work on all kinds of kid-friendly foods from pancakes, sandwiches, fruit, veggies, brownies and more! Whether you have a picky eater or simply want to add more creativity and fun to your family’s meals. These easy-to-use cutters add simplicity to your kitchen and make food more fun. By following us on our social networks and by email we are able to get the best giveaways together on the internet! Please take a minute to follow us!Thanks!Chances of winning depend on entries received. Get Your’s Here! If you have any questions or are a brand/company and would like to work with Paula Stewart please contact us here. LOVE GIVEAWAYS? Disclaimer: PaulaMS’ Giveaways, Reviews, and Freebies nor any blog promoting this giveaway, is not responsible for the awarding of the prize. Sponsors are responsible for prize fulfillment. Any Questions about this giveaway? Email Paula At paula_stewart (at) ymail (dot) com.Disclosure of Material Connection: PaulaMS has received the product mentioned above for free to facilitate the writing of this review. *Some of the links on this blog post are affiliate links. This means if you click on the link and purchase the item, I may receive an affiliate commission. Regardless, she only recommends products or services that she uses personally and believes will add value to readers. I am disclosing this in accordance with the Federal Trade Commission’s 16 CFR, Part 255: Guides Concerning the Use of Endorsements and Testimonials in Advertising. I wasn’t a picky eater when I was growing up. I am the parent of six sons and only one child seems pickier than the others but not so much that it disrupts snacks or meals. My kids would love the drone from the gift guide the best.